At this time of year, it’s easy to walk past sections of browning plants and dismiss the possibility of winter interest. However, for the more enthusiastic plant lover, gardener, designer or landscape painter this is seen as a time to really appreciate the structure and form of a garden while also enjoying hidden gems of color, shade, and shape. The addition of snow can make this contrast all the more glorious. 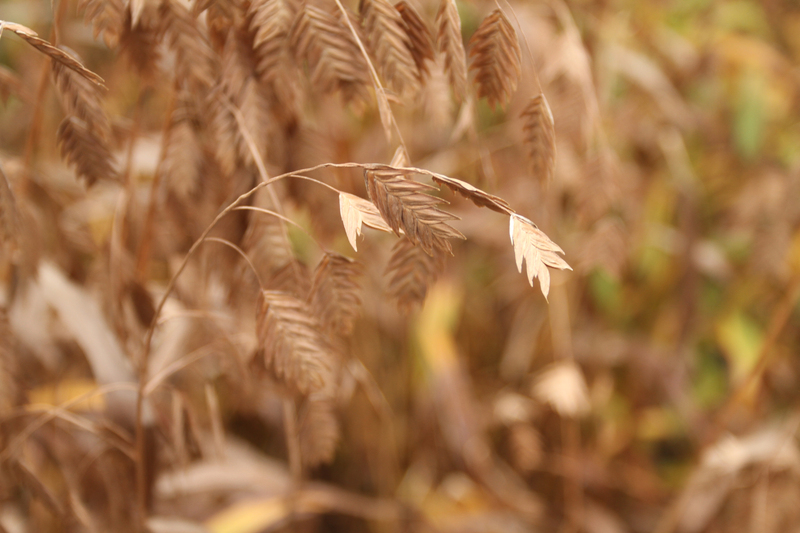 The Northern Spur Preserve is host to Chasmanthium latifolium, a native, perennial, ornamental grass. In winter, you can really see the terrific contrast between the striking yellow and red of the aptly named Cornus sanguinea ‘Midwinter Fire’ and the sea of Chasmanthium latifolium’s beautiful drooping flat panicles of seed heads and coppery brown upright foliage that lead to the stark form of the Amorpha fruticosa so bare and overshadowing in comparison. It really ties the planting together nicely. On the High Line we allow the foliage to remain over winter both for the interest of the foliage and seed heads, but also to protect the crowns from winter freezing. 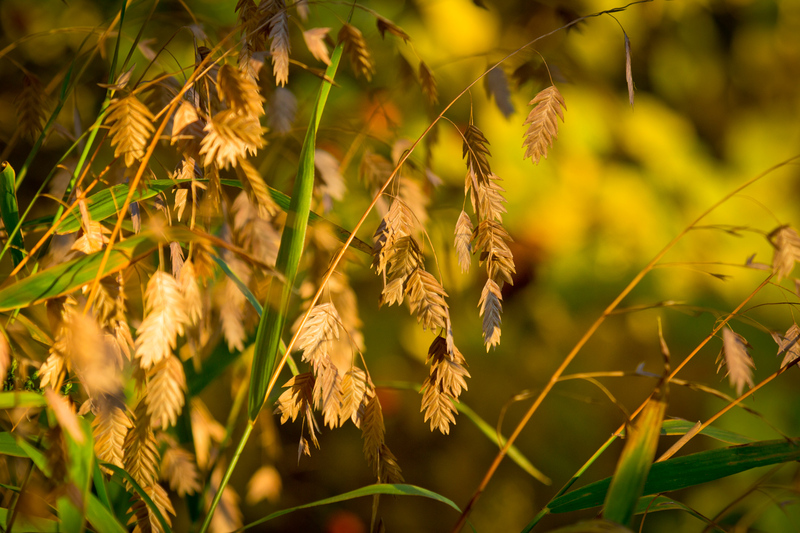 However, it is not only winter when Northern sea oats, a common name derived from the similarity of the seed heads to those of oats, comes into its own. In fact from the time of its emergence in spring it performs strong. We cut it back to the crown in late March or early April and from that point on it is a vigorous grower with the alternate leaf blades reaching up to 10 inches long and 1 inch wide. The seed heads, starting out a beautiful shade of lime green against the backdrop of the much deeper green foliage, will change as the summer rolls on, eventually becoming a browner color late in summer while the foliage turns much more slowly. The deep green leaf blades will brown a little towards the end of summer, but it will not be until the first frost of winter that they take on a pleasing copper brown color. The flowers of Chasmanthium latifolium are wind-pollinated and because of this are not very attractive to pollinators. However the caterpillars of several skippers as well as the caterpillars of some butterflies do feed on the foliage. In its uses in the garden, I’d add a word of caution. Chasmanthium latifolium is a self-seeder and has a fibrous, rhizomatus root system that often causes clonal colonies of plants to develop in ideal conditions where this can be a bully. It grows very easily in wet, medium soils in part shade, and is more aggressive in moist, well-drained soils. I recommend growing this plant in a shadier section of your garden, where you may be finding it hard to establish other plants, or in sunnier, drier areas where it is less likely to take off. If you use the seed heads for seasonal displays and divide the clumps with a spade every couple of years, it is pretty manageable. 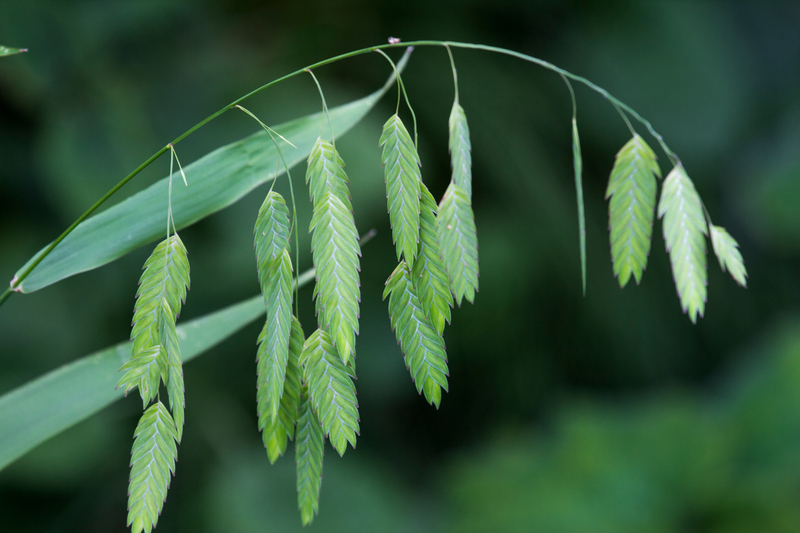 One of the most interesting places where northern sea oats has been found growing well is under black walnut (Juglans nigra). As anyone who has tried to grow under black walnut understands, it can be really hard to get anything to establish due to the toxic juglone they produce, inhibiting respiration and often killing plants. On the High Line between 15th and 16th Streets. The High Line’s planting design is inspired by the self-seeded landscape that grew up between rail tracks after the trains stopped running in the 1980s. Today, the High Line includes more than 500 species of perennials, grasses, shrubs, and trees – each chosen for their hardiness, adaptability, diversity, and seasonal variation in color and texture. Some of the species that originally grew on the High Line’s rail bed are reflected in the park landscape today. Every week we share one of our gardeners’ current favorites with you. Our horticultural team counts on members and friends like you to help keep the High Line beautiful and thriving. Join our community of supporters who play an essential role in the High Line’s most important gardening projects. TD Bank is the Presenting Green Sponsor of the High Line.